Prepare noodles according to package directions, omitting salt. Meanwhile, whisk together peanut butter, water, soy sauce, vinegar, chili sauce and lime juice. 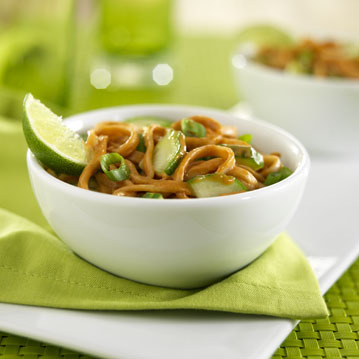 Toss together noodles, peanut sauce, cucumber and onions. Chinese wheat noodles cook in 3 to 5 minutes and are found in the Asian-food section of supermarkets. Chow mein stir-fry noodles, chuka soba or ramen noodles also can be used.